Kamehameha senior T.J. Kua was second in the state tournament a year ago. He'll be gunning for the title again this year. IN the eyes of a 3-year-old, a back yard is a mysterious land to be pillaged and conquered. For Thomas James Kua, it was a little bit of Waialae, Augusta and St. Andrews rolled into one. On many pristine days on his native Kauai, T.J. picked up his custom-made golf club, his left-handed swat sending balls near and far. It was a good life. "I could take a full swing there. My dad (Stan) had a kid's club that he cut down for me," he remembers. Nobody bothered to tell T.J. that other 3-year-olds were cooped up in their living rooms with Barney and Elmo. Kua will play at UH after graduating from Kamehameha. When T.J. started elementary school, Grandma picked him up at 2:30 each afternoon. Grandma would always take him to the course to swing at balls, but only if the homework was done. Ethel Ishii knew a thing or two about taking little boys to the golf course. What a cool Grandma. 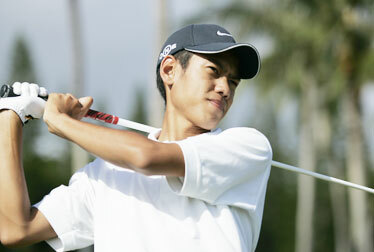 KUA WAS CLOSE a year ago, finishing second to Honokaa's Sean Maekawa in the HHSAA state championships at Waikoloa. 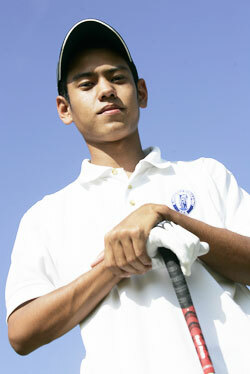 This week, the Kamehameha senior will return home to his stomping grounds -- Wailua Golf Course -- for the 2008 state tourney. Iolani standout David Fink knew about T.J. long before high school. "My mom said he was an outstanding junior golfer. I thought he was out of my league, too cool and too good for me," he said. "I met him on Kauai in one of the HSJGA tournaments. He's just a down-to-earth kid who cares about others before himself." Over the span of eight days in mid-April, T.J. lived the life of a golfaholic. He opened the Interscholastic League of Honolulu championship tourney with a 65 at Oahu Country Club, one stroke behind Punahou's Alex Ching, one of his closest friends. Three days later, he shot 72 and 73 in the amateur flight of the Mid-Pacific Open, but struggled in the third round with an 80. "I made the turn at 1 over, the tougher side," he said. "I don't know what happened after that." David Ishii's cell phone received a text message not long after that. It was T.J.
"He doesn't ask too many questions," Ishii said, "but he texted me, 'What should I do tomorrow? Be aggressive? Or be patient and let the leaders come back?' "
A former player on the Japan Golf Tour and winner of the PGA Tour's Hawaiian Open in 1990, Ishii was competing in the pro flight. He immediately read warning signs. The uncle texted the nephew back. "What you doing worried about that? Play your game," he wrote. "Don't worry about what the other guys are gonna do. Just think about what you gotta do. If you make pars on that kind of tough course, that's enough. Just play your best." T.J. shot a 73 on the final day and won in a playoff. He went to go watch his uncle finish his round. "I heard a roar and I started running, but it was too late," he said. "I just missed seeing (a) putt he made." The next day, at the ILH championship, he rallied, but Ching wound up with a two-stroke win at Waialae, where gusts were up to 30 mph. T.J. was spent. Home beckoned. TEN HOURS a night, the son snoozes. Stan likes having T.J. home on some weekends, awake or not. After 25 years on the police force, Stan retired and went to work part time at a golf course. When it comes to modified clubs on Kauai, Stan is literally the man. The former UH football player was always a golfer at heart. He met Cathy Ishii on the golf course through a mutual friend, and they began golfing together. They married in 1987, and T.J. was in junior golf by 4 1/2 . Stan sees a lot of David in T.J.
"He's very humble, very caring. A spitting image of his Uncle David," he said. T.J. cuts his own path sometimes. At 10, he planned on going to a mainland college. By 13, he had been accepted by Kamehameha Schools. Cathy Kua wasn't quite prepared to let him go that soon. "Even when I got my acceptance letter, it kind of surprised her that I actually wanted to go. She asked me if I was really going," T.J. said. That fall, they flew to Honolulu, checked out his dorm room and left T.J. on campus. Stan and Cathy got into their rental car and headed back to the airport. Mom couldn't stop crying. "I couldn't sleep at night," T.J. remembers. "Not having someone to wake you up in the morning. But I made friends and got comfortable. The toughest part of being away is doing your own laundry." He has a 3.1 grade-point average, will graduate in June and has accepted a golf scholarship from UH. "It was tough, school-wise, but it pays off in the end," T.J. said. WHEN T.J. IS BACK on Kauai, he keeps an eye on baby brother Trevor, now 10. Before he became a border student, T.J. did his share of Trevor's diapers. "I stayed away from the stinky ones. I did the easy ones. I think baby poo with the diaper smell is the worst smell in the world," he said. Dad admires his first son. "He took a big responsibility of helping to raise his brother. He's like a mentor to him," Stan said. Like T.J., Trevor has golfed since he could waddle around. Grandma takes him to the course every day. This weekend, the state tourney awaits. The title sponsorship has been provided for years by -- who else? -- David Ishii. It all began with Chica Ishii, who helped run junior golf on Kauai way back in the day, when son David was a keiki. A history of giving repeats itself. For T.J. Kua, the legacy continues.